This will probably be one of the first meals you'll learn to cook if you're a novice in the kitchen: it's very easy, very quick and can be tasty and filling - perfect student food. However, despite being a very simple dish, there are literally hundreds of different ways of cooking and combining pasta and sauces, which is why you see it on every menu, from your local pub to the best restaurant in town. It's also very easy to get it wrong and pasta that is just a little over or undercooked will not make for a pleasant meal. Although Italy is renowned as being the birthplace of pasta, there are mentions of it in ancient Greek and Arabic texts and various forms of pasta were undoubtedly used in cuisines all around the world. However, it was the Italians who truly adopted pasta and developed the possibilities of this wonderfully versatile food. These are small, ridged tubes cut on the diagonal. The ridges help to hold the sauce and penne works well with chunky tomato-based sauces. Forget the macaroni cheese you used to get served for your school lunch; if this is made well, it's absolutely delicious. You might know these better as 'bows'. They are great with tomato sauces or in a pasta salad. These long, thin strands are probably most widely eaten as spaghetti Bolognese. However, they also work well with really simple sauces such as olive oil, garlic and herbs. A kind of squashed, wider version of spaghetti, tagliatelle is often combined with a creamy sauce, such as carbonara. It's really all to do with timings and tasting when it comes to cooking pasta. Different varieties take a longer or shorter time to cook, so always check the instructions on the packet. However, you shouldn't just rely on this and it's advisable to try a piece before deciding if it's time to dish up. 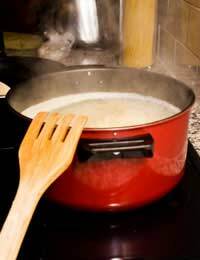 Pour boiling water from the kettle into a large pan and place over a high heat to bring it back to the boil. Add a pinch of salt. Most pasta swells significantly while cooking and you may end up with far too much. Add the pasta to the boiling water and let it cook, according to the packet instructions. Try a piece to check you're happy that it's cooked and, if not, leave it a little longer. You want your pasta to retain its shape and have a little bite to it (al dente). Drain it well and return to the hot pan (off the heat) and stir in your sauce. It's important to do this and mix well before serving, as pasta will stick together once it's drained. Fresh pasta cooks a lot more quickly than dried and it's also more delicate so try and avoid stirring it while it's cooking. It will usually take no more than a few minutes to cook so you really need to keep an eye on the time as, if it's overcooked, it will become very soggy and lose its shape. As with dried pasta, cook in a large pan of boiling, salted water and drain very thoroughly once it's cooked. Again, you should add the sauce immediately and mix well, but carefully, before serving. It takes a little practise but pasta really is quick and easy to prepare. Try some of the more unusual varieties for a change and have a go at making your own sauces. If you want to cook pasta without using saucepans or seives - you need one of thesehttp://bit.ly/QIHHra they are brilliant! !